We divided into two groups walked in Bashamichi and the other two in Isezaki-cho, Northside and Eastside of JR Kannai Station in Yokohama. Those two areas are geographically close but have different characters. 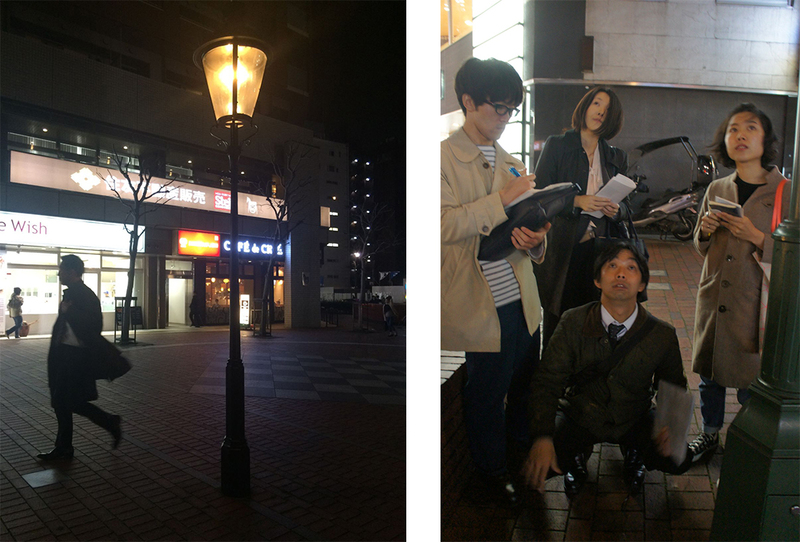 ■Over 150 years old gas lamps and early modern architectures create nostalgic scenarios in Bashamichi. Most elements and buildings have been modernized to suit for urban life style in Isezaki-cho. Both Bashamichi and Isezaki-cho are on the same stretch of the city, but have totally in contrast of these characters. We started exploring those two areas to find Heroes and Villains of light, and to reveal what kind of light defines the character of each area. Contrast between gas lamp and shop interior light. 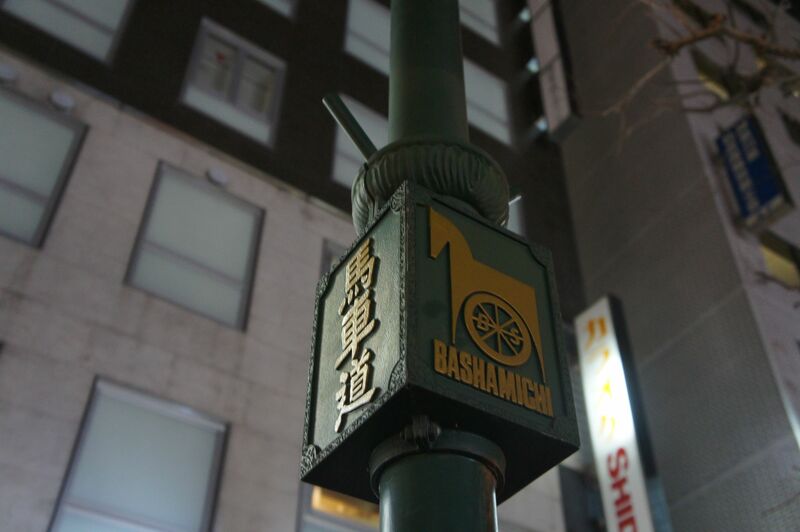 Bashamichi was the first place that gas lamps were installed in Japan. Before those gas lamps were produced in Japan, people carried portable lanterns with candle light. 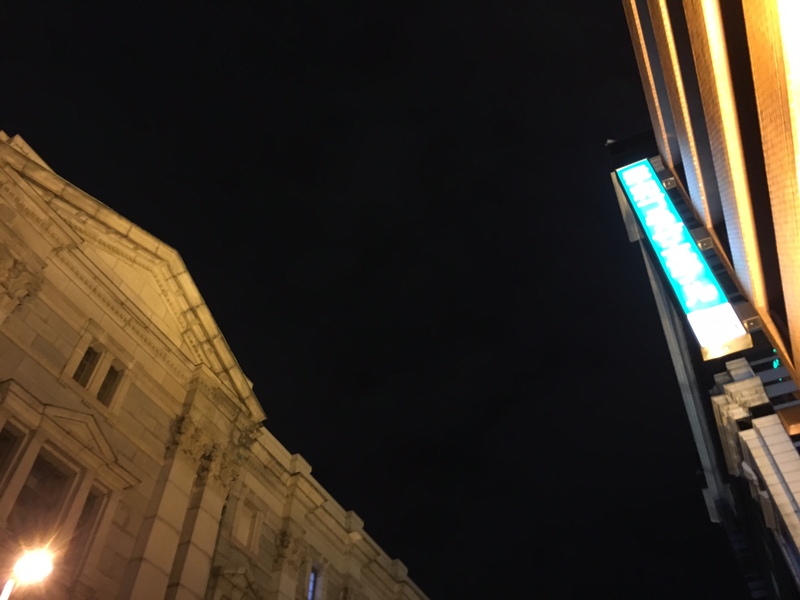 We started the walk, imagining how people felt when they saw gas lamps at the first time. Group 1 started at Kannai Station. 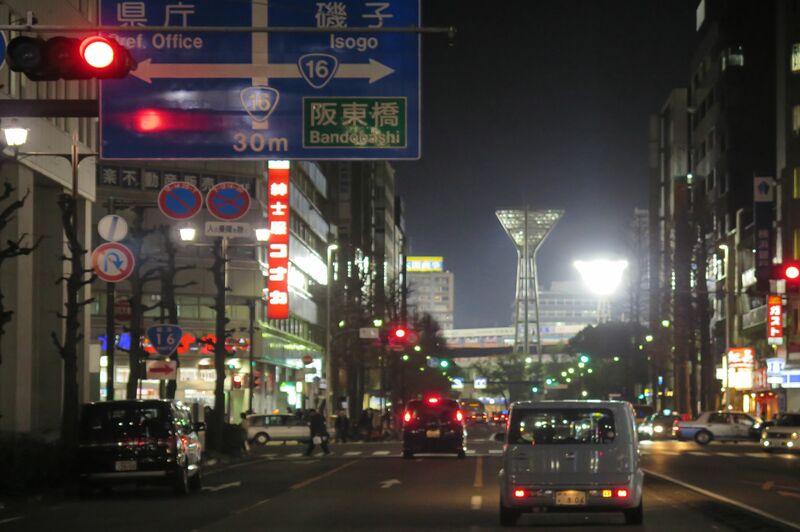 Arriving at Bashamichi and walking further down to the junction, first light to note was stadium lighting. We still had a long distance to Yokohama Stadium though, the LED light from the stadium looked very bright and stinging to the eyes. 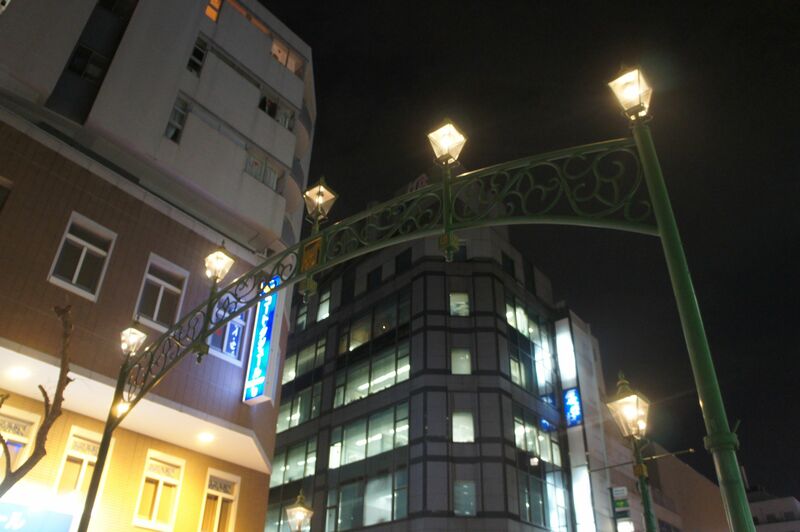 The gas lamps installed along Bashamichi were 2000K warm light. The illuminance, was perceived low to all the group members; was about 16 lx. A neighboring hair salon was emitting glittery white light. Those two contrasting lightings looked like an angel and a devil fighting. Walking further down, Bashamichi meets Honcho Street. Many government buildings in western style dominate this area and it was rather dark as there were no spilled light from shop interiors. Some features were illuminated even though there was only a few people passes by. 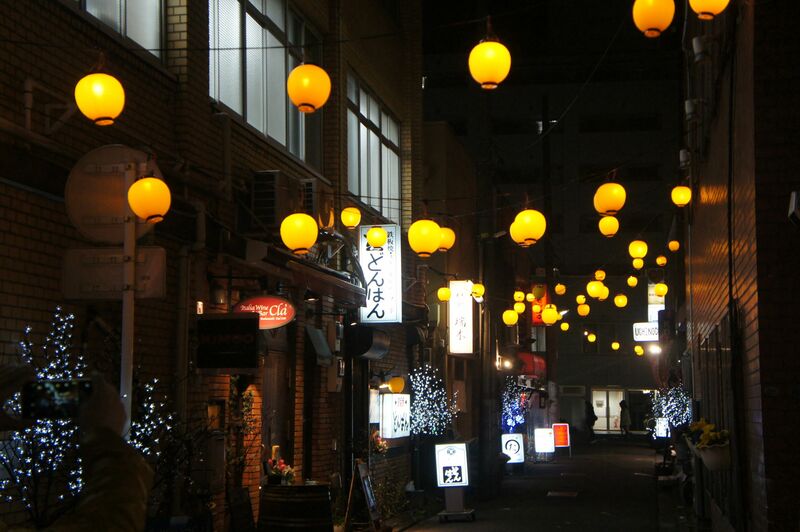 Overall, the area was messed up with nostalgic atmosphere with urban lighting trends. After a long walk, we finally found the place we were able to feel the air from Meiji-era. Lantern street of high repute by members. Very bright light from Yokohama Stadium. ■Group 2, the member of five including our leader Mr. Mende, started walking in Bashamichi. The gas lamps created a nice ambience, yet the junction located in the middle of street looked dim. Some members commented that it was nice to maintain the antique gas lamps but overall night scape needed to be improved. Off to a minor street, the most loved lighting item was the batch of lanterns hang overhead. Those lanterns were hang on wires from one building to the opposite building and it created exotic scenery together. 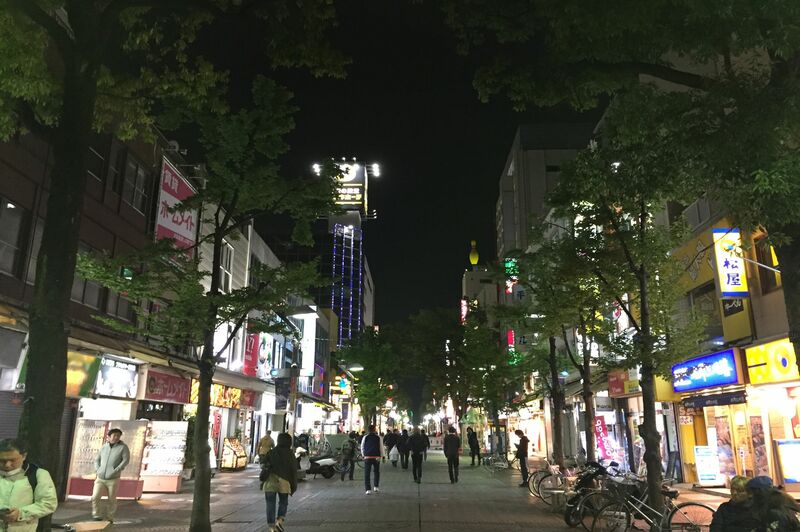 It was great that neighboring shops cooperated to make the night scene beautiful. 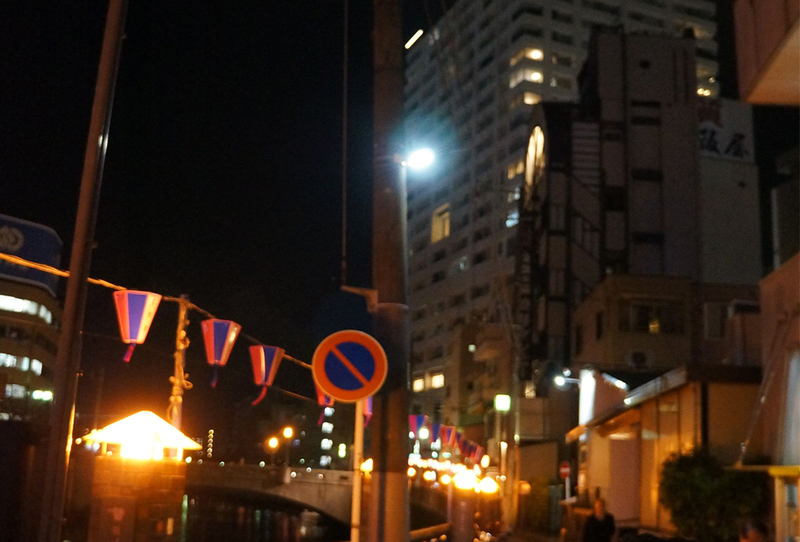 Amongst the dim street Bashamichi, some grand buildings were left unlit and it made the area even darker. Disappointingly some of those buildings got reflection of reflected or spilled light from opposite hotel. We again recognized the importance of lighting planning with a good consideration to the neighborhoods. ■Group 3 walked around Isezaki mall. Isezaki mall has been developed since Yokohama harbor had opened, and was the first mall with pedestrian streets in Japan. As we stepped into the mall, neon and decorative lightings welcomed us. Those lightings were neither stylish nor methodically designed. 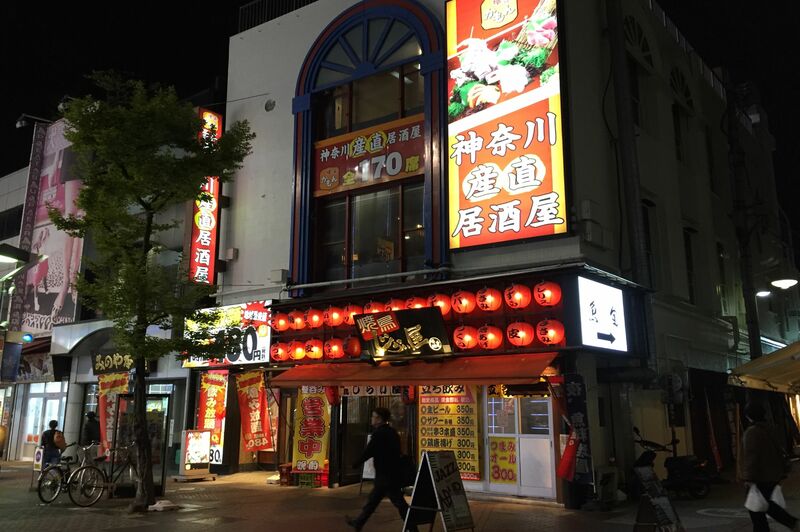 Blueish linear lights forming grids of Pachinko parlor facade, red lanterns hang on a bar entrance, a pharmacy with old fashioned luminaires and a futuristic looking Tabaco shop with linear light. 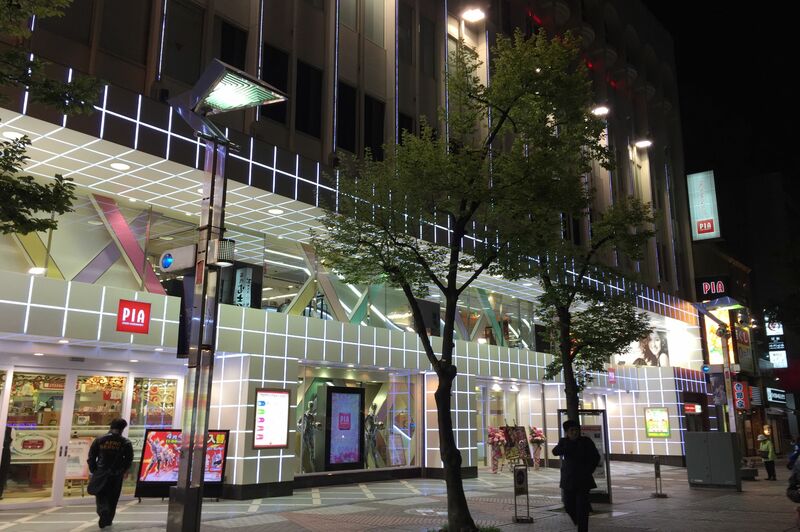 All of these contributed to create nightscape in Isezaki Mall. This sort of mess added the charm and warmth to the area. This unorganized group of lightings tend to be classified as a villain, yet we could say it is a hero this time. It is because it welcomes whatever character each other has and coexist in the same area, and are loved by the locals and passerby. Warm lighting of the bar. A row of Pachinko parlors in the Mall. Cherry River from the other side. ■Group 4 had a master of Iseszaki-cho, so the group excursed off the main track. Unlike the bright and busy mall, there were small stylish shops in a modest lighting along the ally. Those are in a hidden area, but some are nicely designed including lighting. Cherry River was the most exciting spot for the members. The scenery at the riverside promenade was nostalgic with orange light from sodium lamps and paper lanterns were rhythmically installed. It was a comfortable lighting environment, not too bright and not too dark. Only the flashy blueish white light from the power poles were disappointing. Back to Isezaki mall, Pachinko parlors built in a row dominated the view. Most of them were over 5000lx cool white façade lighting, but one parlor looked exceptional among those; it was elegantly lit up with 3500K warm and gentle light. Security lighting spoiling the mood. 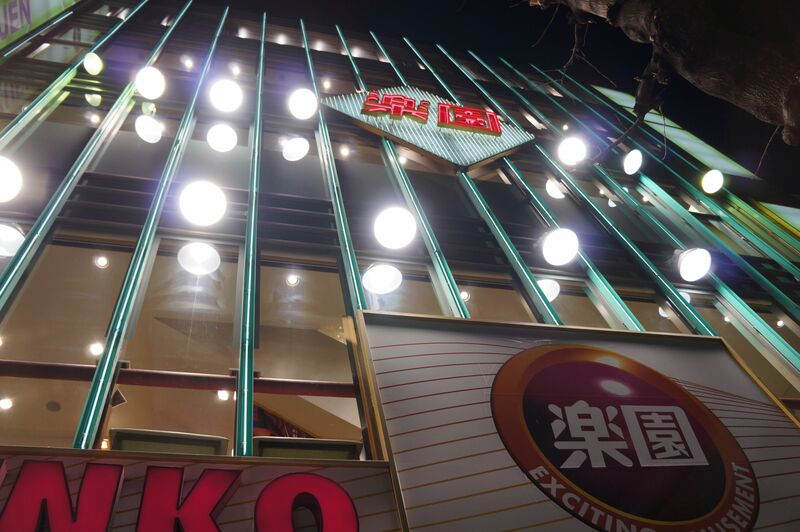 Intense facade lighting of Pachinko parlor with high-power flood light. 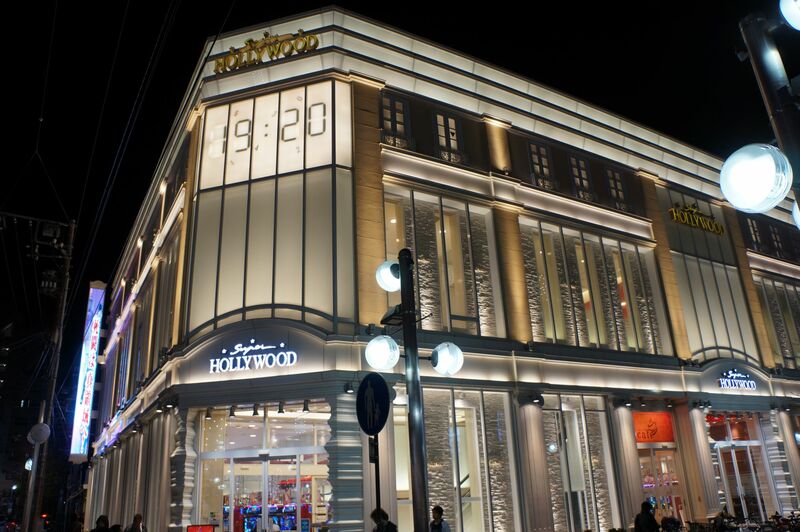 facade lighting of Pachinko parlor. ■Bashamichi and Isazaki-cho are geographically close but characteristically far apart. Both areas have less visitors recently as Minatomirai district has been winning to draw more visitors by its fast urban growth. 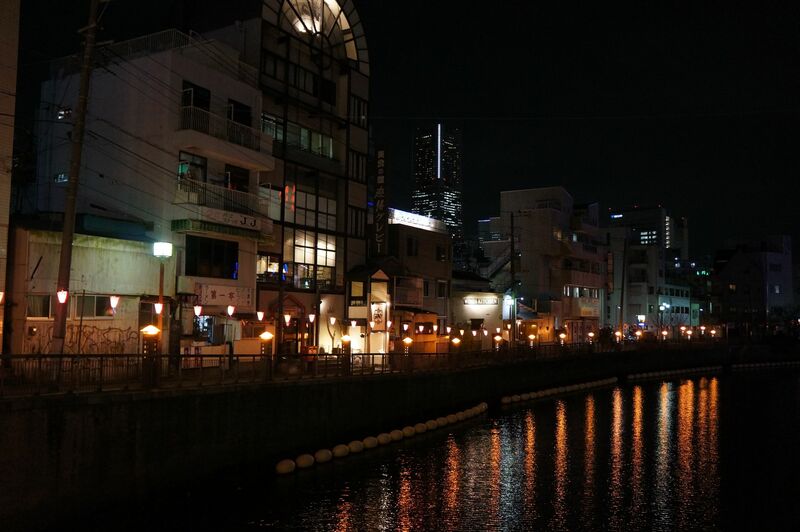 However, we felt both Bashamichi and Isezaki-cho had a potential to get the visitors back with appealing evening scenes.